If you’ve read our other blog posts, you’ve seen the emphasis that we place on crafting great content. Content can include anything from images and graphics, creative storytelling, infographics, blog posts, even trending articles. Strategic content plays a major role in crafting a successful content calendar. While there’s always a time and place for a spur of the moment social post, strategy and planning are key when it comes to successful social media management. At Liquified Creative, we handle social media management and marketing for a lot of our clients. In order to take full advantage of what each platform has to offer, we make sure to carefully analyze performance, craft and curate relevant content, and ultimately develop a social media content calendar that combines all of these efforts into one solid strategy. 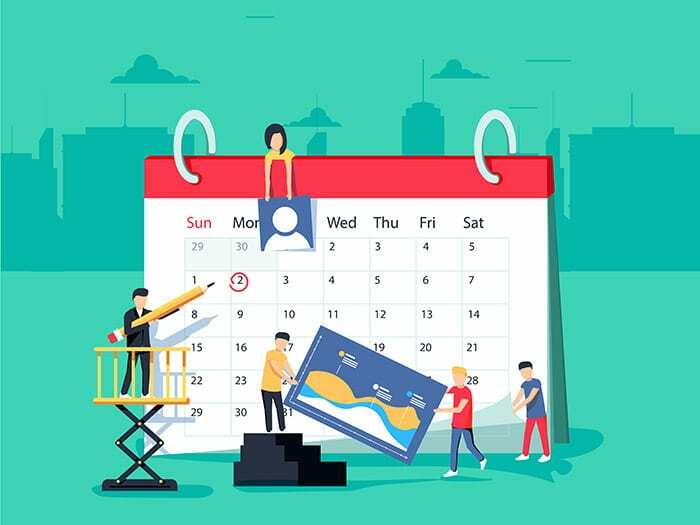 If your social media is leaning towards more of that spontaneous and off-the-cuff approach, we recommend you develop your own social media content calendar. If you aren’t sure where to start, don’t worry, because we’ve broken in down for you into four simple steps. Choosing the right social media channels is an important part of creating a social network for your business. Start by defining your brand and what you are selling. Next, determine your audience. Certain age groups use certain social media channels, and furthermore, certain demographics and characteristics flock to specific social outlets. Once you’ve determined who your target is, then you are able to figure out which network or networks align with that target. If you’re already active on social media, take a look at your insights and analytics to see which of your past posts did well with your current audience. If you’re not already on social, take some time to research what your competitors are doing and how that’s working out for them. Are they winning with shared articles? Videos? Images? See what kind of content is getting the most engagement. Set a schedule that dictates what and how often you’ll post on each social channel. There are some industry standards, and tips from the experts that you can reference. However, you should really remain tuned in to your audiences to see if your posting schedule is turning anyone off. Try referencing the insights and analytics you reviewed and see what times of day your audience is most active on each platform, and what types of content really shine. Finally, you can start gathering content and planning out when and how to share it. Get started with something as simple as an excel doc to organize. Come up with 3-5 themes to center your content development on based on your business and your target market. This will help to ensure that the social content aligns with your brand. Using a solid scheduling program or management system will allow you to schedule all of this content in advance, and not have to worry about posting on a day-to-day basis. You should still monitor your social to ensure that your posts are being deployed properly and that they are being received well. You’ll have to learn to walk this fine line of both planning ahead and remaining flexible. If all of this seems like a foreign language to you, or you’re simply too busy and lack the time to dedicate to managing your social media, contact Liquified Creative and we’ll take care of it for you.